This article is about the Mexican Marian title. For the Spanish Marian title, see Our Lady of Guadalupe, Extremadura. Basilica of Our Lady of Guadalupe, Tepeyac Hill, Mexico City, Mexico. A contemplating woman clothed in a pink tunic robe covered by a cerulean mantle emblazoned with eight-point stars; while she stands atop a darkened crescent moon, carried by a cherubic angel. Official Catholic accounts state that the Virgin Mary appeared four times before Juan Diego and one more before Juan Diego's uncle. According to these accounts the first apparition occurred on the morning of December 9, 1531, when a native Mexican peasant named Juan Diego saw a vision of a maiden at a place called the Hill of Tepeyac, which would become part of Villa de Guadalupe, a suburb of Mexico City. Speaking to Juan Diego in his native Nahuatl language (the language of the Aztec empire), the maiden identified herself as the Virgin Mary, "mother of the very true deity" and asked for a church to be built at that site in her honor. Based on her words, Juan Diego then sought out the archbishop of Mexico City, Fray Juan de Zumárraga, to tell him what had happened. As the bishop did not believe Diego, on the same day, Juan Diego saw the Virgin Mary for a second time (the second apparition); she asked him to keep insisting. On Sunday, December 10, Juan Diego talked to archbishop for a second time. The latter instructed him to return to Tepeyac Hill, and ask the lady for a miraculous sign to prove her identity. That same day the third apparition occurred when Diego returned to Tepeyac and, encountering the Virgin Mary reported the bishop's request for a sign; she consented to provide one on the following day (December 11). By Monday, December 11, however, Juan Diego's uncle Juan Bernardino had fallen sick and Juan Diego was obliged to attend to him. In the very early hours of Tuesday, December 12, Juan Bernardino's condition having deteriorated overnight, Juan Diego set out to Tlatelolco to fetch a priest to hear Juan Bernardino's confession and minister to him on his death-bed. Preliminary drawing of the Mexican Coat of arms, ca. 1743. In order to avoid being delayed by the Virgin and ashamed at having failed to meet her on the Monday as agreed, Juan Diego chose another route around the hill, but the Virgin intercepted him and asked where he was going (fourth apparition); Juan Diego explained what had happened and the Virgin gently chided him for not having had recourse to her. 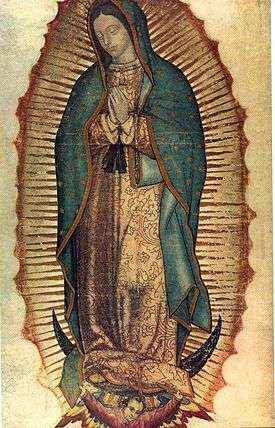 In the words which have become the most famous phrase of the Guadalupe event and are inscribed over the main entrance to the Basilica of Guadalupe, she asked: "No estoy yo aqui que soy tu madre?" (Am I not here, I who am your mother?). She assured him that Juan Bernardino had now recovered and she told him to gather flowers from the top of Tepeyac Hill, which was normally barren, especially in December. Juan followed her instructions and he found Castilian roses, not native to Mexico, blooming there. The Virgin arranged the flowers in Juan's tilma, or cloak, and when Juan Diego opened his cloak before archbishop Zumárraga on December 12, the flowers fell to the floor, and on the fabric was the image of the Virgin of Guadalupe. The next day, on December 13, Juan Diego found his uncle fully recovered, as the Virgin had assured him, and Juan Bernardino recounted that he too had seen her, at his bed-side (fifth apparition); that she had instructed him to inform the bishop of this apparition and of his miraculous cure; and that she had told him she desired to be known under the title of Guadalupe. The bishop kept Juan Diego's mantle first in his private chapel and then in the church on public display where it attracted great attention. On December 26, 1531 a procession formed for taking the miraculous image back to Tepeyac where it was installed in a small hastily erected chapel. In course of this procession, the first miracle was allegedly performed when an Indian was mortally wounded in the neck by an arrow shot by accident during some stylized martial displays executed in honour of the Virgin. In great distress, the Indians carried him before the Virgin's image and pleaded for his life. Upon the arrow being withdrawn, the victim made a full and immediate recovery. Juan Diego's tilma has become Mexico's most popular religious and cultural symbol, and has received widespread ecclesiastical and popular support. In the 19th century it became the rallying call of American-born Spaniards in New Spain, who saw the story of the apparition as legitimizing their own Mexican origin and infusing it with an almost messianic sense of mission and identity - thus also legitimizing their armed rebellion against Spain. Historically the devotion to Our Lady of Guadalupe did not lack clerical opponents within Mexico, especially in the early years, and in more recent times some Catholic scholars, and even a former abbot of the basilica, Monsignor Guillermo Schulenburg, have openly doubted the historical existence of Juan Diego, referring to the devotion as merely symbolic, propagated by a sensational cult. Nonetheless, Juan Diego was canonized in 2002, under the name Saint Juan Diego Cuauhtlatoatzin. 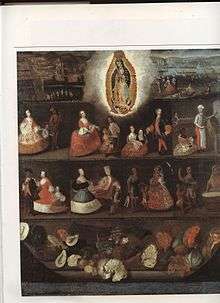 While the image garners much religious devotion and Mexican patriotism, scholarly criticism on the image is also notable, considering the artistic disproportion of the image, the similarity of the image to Spanish pre-colonial artwork closely related to the Aztec colony at the time, the alleged relationship of Marcos Cipac de Aquino in either inventing or amending the tilma cloak, and the public declaration of the abbot of the Guadalupe shrine pertaining to the false existence of the Marian apparitions. A relief of the Madonna and Child installed in the year 1499 within the chapel of the choir in the Monastery of Guadalupe, in Caceres, Extramadura, Spain, allegedly serving as inspiration for Marcos Cipac de Aquino's invention of the Mexican image. Note the similarity of the aureola and cherub underneath the Virgin. Following the Conquest in 1519–21, the Spanish destroyed a temple of the mother goddess Tonantzin at Tepeyac outside Mexico City, and built a chapel dedicated to the Virgin on the site. Newly converted natives continued to come from afar to worship there, often addressing the Virgin Mary as Tonantzin. What is purported by some to be the earliest mention of the miraculous apparition of the Virgin is a page of parchment (the Codex Escalada) which was discovered in 1995 and, according to investigative analysis, dates from the sixteenth century. This document bears two pictorial representations of Juan Diego and the apparition, several inscriptions in Nahuatl referring to Juan Diego by his Aztec name, and the date of his death: 1548, as well as the year that the Virgin Mary appeared: 1531. It also contains the glyph of Antonio Valeriano; and finally, the signature of Fray Bernardino de Sahagun that was authenticated by experts from the Banco de Mexico and Charles E. Dibble. Scholarly doubts have been cast on the authenticity of the document, however. A more complete early description of the apparition occurs in a 16-page manuscript called the Nican mopohua, which was acquired by the New York Public Library in 1880, and has been reliably dated in 1556. This document, written in Nahuatl, but in Latin script, tells the story of the apparitions and the supernatural origin of the image. It was probably composed by a native Aztec man, called Antonio Valeriano, who had been educated by Franciscans. The text of this document was later incorporated into a printed pamphlet which was widely circulated in 1649. In spite of these documents, there are no written accounts of the Guadalupe vision by Catholic clergymen of the 16th century, as there ought to have been if the event had the importance it is claimed to have had. In particular, the canonical account of the vision features archbishop Juan de Zumárraga as a major player in the story, but, although Zumárraga was a prolific writer, there is nothing in his extant writings that can confirm the story. The written record that does exist suggests the Catholic clergy in 16th century Mexico were deeply divided as to the orthodoxy of the cult springing up around the image of Our Lady of Guadalupe, with the Franciscan order (who had custody of the chapel at Tepeyac) being strongly opposed to the cult, while the Dominicans supported it. "The devotion at the chapel...to which they have given the name Guadalupe was prejudicial to the Indians because they believed that the image itself worked miracles, contrary to what the missionary friars had been teaching them, and because many were disappointed when it did not." The banner of conquistador Hernan Cortes from year 1521, which remained within the Archbishop's villa during the time of the Guadalupe apparitions, allegedly serving as inspiration for Marcos Cipac de Aquino's invention of the image. Note the disproportionate, uncentered hairline and separated pinky finger. The next day Archbishop Montúfar opened an inquiry into the matter. At the inquiry, the Franciscans repeated their position that the image encouraged idolatry and superstition, and four witnesses testified to Bustamante's claim that the image was painted by an Indian, with one witness naming him "the Indian painter Marcos". This could refer to the Aztec painter Marcos Cipac de Aquino, who was active at that time. But "if he did, he did so without making a preliminary sketch - in itself a near-miraculous procedure.[...] Cipac may well have had a hand in painting the Image, but only in painting the additions, such as the angel and moon at the Virgin's feet", claims Prof. Jody Brant Smith (referring to Philip Serna Callahan's examination of the tilma using infrared photography in 1979). Ultimately Archbishop Montúfar (himself a Dominican) decided to end Franciscan custody of the shrine. From then on the shrine was served by diocesan priests under the authority of the archbishop. Moreover, Archbishop Montúfar authorized the construction of a much larger church at Tepeyac, in which the tilma was mounted and displayed. The report of this 1556 inquiry is the most extensive documentation concerning the Virgin of Guadalupe from the 16th century, and significantly, it makes no mention of Juan Diego, the miraculous apparition, or any other element from the legend. But if the miracle story did have currency at that time, it seems strange that it would have been omitted from this report. In the late 1570s, the Franciscan historian Bernardino de Sahagún denounced the cult at Tepeyac and the use of the name "Tonantzin" to call Our Lady in a personal digression in his General History of the Things of New Spain, in the version known as the Florentine Codex. Sahagún's criticism of the cult seems to have stemmed primarily from his concern about a syncretistic application of the native name Tonantzin to the Virgin Mary. However, Sahagún often used the same name in his sermons as late as the 1560s. In the 16th century and probably continuing into the early 17th century, the image was modified by adding the mandorla-shaped sunburst around the Virgin, the stars on her cloak, the moon under her feet, and the angel with folded cloth supporting her - as was determined by an infrared and ocular study of the tilma in 1979. Virgin of Guadalupe circa 1700s featuring a novelty crown on the Virgin's head, later removed on 23 February 1888. The first printed account of the history of the apparitions and image occurs in Imagen de la Virgen Maria, Madre de Dios de Guadalupe, published in 1648 by Miguel Sánchez, a diocesan priest of Mexico City. The next printed account was a 36-page tract in the Nahuatl language, Huei tlamahuiçoltica ("The Great Event"), which was published in 1649. This tract contains a section called the Nican mopohua ("Here it is recounted"), which we have already touched on above. The composition and authorship of the Huei tlamahuiçoltica is assigned by a majority of scholars to Luis Laso de la Vega, vicar of the sanctuary of Tepeyac from 1647-1657. Nevertheless, the most important section of the tract, the Nican Mopohua, appears to be much older. It has been attributed since the late 1600s to Antonio Valeriano (c. 1531-1605), a native Aztec man who had been educated by the Franciscans and who collaborated extensively with Bernardino de Sahagún. A manuscript version of the Nican Mopohua, now held by the New York Public Library, appears to be datable to the mid-1500s, and may have been the original work by Valeriano that was used by Laso in composing the Huei tlamahuiçoltica. Most authorities agree on the dating and on Valeriano's authorship. On the other hand, in 1666, the scholar Luis Becerra Tanco published in Mexico a book about the history of the apparitions under the name "Origen milagroso del santuario de Nuestra Señora de Guadalupe," which was republished in Spain in 1675 as "Felicidad de Mexico en la admirable aparición de la virgen María de Guadalupe y origen de su milagrosa Imagen, que se venera extramuros de aquella ciudad." In the same way, in 1688, Jesuit Father Francisco de Florencia published "La Estrella del Norte de México" with the history of the same apparitions. Two separate accounts, one in Nahuatl from Juan Bautista del Barrio de San Juan from the 16th century, and the other in Spanish by Servando Teresa de Mier date the original apparition and native celebration on September 8 of the Julian calendar, but also note that the Spaniards celebrate it on December 12 instead. It was due to the Informaciones Jurídicas de 1666 for which it was requested and obtained a feast day in name of Our Lady of Guadalupe, and the transfer of the date of the feast of the Virgin of Guadalupe, from September 8 to December 12, the latest date on which the Virgin supposedly appeared to Juan Diego. The initiative to perform them was made by Francisco de Siles who proposed to ask the Church of Rome a Mass itself with allusive text to the apparitions and stamping of the image, along with the divine office itself, and the precept of hearing Mass on December 12, the last date of the apparitions of the Virgin to Juan Diego as the new date to commemorate the apparitions (which until then was on September 8, the birth of the Virgin). In 1666, the Church in México began gathering information from people who reported having known Juan Diego, and in 1723 a formal investigation into his life was ordered, where more data was gathered to support veneration. Because of the Informaciones Jurídicas de 1666 in the year 1754, the Sacred Congregation of Rites confirmed the true value of the apparitions and granted celebrating Mass and Office for the feast of Guadalupe on December 12. These published accounts of the origin of the image venerated in Tepeyac increased interest in the identity of Juan Diego, the original recipient of the vision. A new Basilica church was built to house the image. Completed in 1709, it is now known as the Old Basilica. The image had originally featured a 12-point crown on the Virgin's head, but this disappeared in 1887-88. The change was first noticed on 23 February 1888, when the image was removed to a nearby church. Eventually a painter confessed on his deathbed that he had been instructed by a clergyman to remove the crown. This may have been motivated by the fact that the gold paint was flaking off of the crown, leaving it looking dilapidated. But according to the historian David Brading, “the decision to remove rather than replace the crown was no doubt inspired by a desire to 'modernize' the image and reinforce its similarity to the nineteenth-century images of the Immaculate Conception which were exhibited at Lourdes and elsewhere… What is rarely mentioned is that the frame which surrounded the canvas was amended to leave almost no space above the Virgin's head, thereby obscuring the effects of the erasure." it is unclear for the reason why the frame was adjusted to lower the frame, giving the impression that the crown's covered area would not be easily noticed. An 18th-century hagiographic painting of God the Father fashioning the image. A different crown was installed to the image. On 8 February 1887, a Papal bull from Pope Leo XIII granted permission a Canonical Coronation of the image, which occurred on 12 October 1895. Since then the Virgin of Guadalupe has been proclaimed "Queen of Mexico", "Patroness of the Americas", "Empress of Latin America", and "Protectress of Unborn Children" (the latter two titles given by Pope John Paul II in 1999). Under this title, she was also proclaimed "Heavenly Patroness of the Philippines" on 16 July 1935 by Pope Pius XI both witnessed and signed by Cardinal Eugenio Pacelli, a designation he later rescinded on 12 September 1942 upon becoming Pope Pius XII. On 25 March 1966, Pope Paul VI presented a Golden Rose to the sacred image. Finally, under Pope John Paul II the move to beatify Juan Diego intensified. John Paul II took a special interest in non-European Catholics and saints. During his leadership, the Congregation for the Causes of Saints declared Juan Diego "venerable" (in 1987), and the pope himself announced his beatification on 6 May 1990, during a Mass at the Basilica of Our Lady of Guadalupe in Mexico City, declaring him “protector and advocate of the indigenous peoples," with December 9 established as his feast day. At that time historians revived doubts as to the quality of the evidence regarding Juan Diego. The writings of bishop Zumárraga, into whose hands Juan purportedly delivered the miraculous image, did not refer to him or the event. The record of the 1556 ecclesiastical inquiry omitted him, and he was not mentioned in documentation before the mid-17th century. In 1996 the 83-year-old abbot of the Basilica of Guadalupe, Guillermo Schulenburg, was forced to resign following an interview published in the Catholic magazine Ixthus, in which he was quoted as saying that Juan Diego was "a symbol, not a reality", and that his canonization would be the “recognition of a cult. It is not recognition of the physical, real existence of a person.”  In 1883 Joaquín García Icazbalceta, historian and biographer of Zumárraga, in a confidential report on the Lady of Guadalupe for Bishop Labastida, had been hesitant to support the story of the vision. He concluded that Juan Diego had not existed. In 1995, Father Xavier Escalada, a Jesuit whose four volume Guadalupe encyclopedia had just been published, announced the existence of a sheet of parchment (known as Codex Escalada), which bore an illustrated account of the vision and some notations in Nahuatl concerning the life and death of Juan Diego. Previously unknown, the document was dated 1548. It bore the signatures of Antonio Valeriano and Bernardino de Sahagún, which are considered to verify its contents. The codex was the subject of an appendix to the Guadalupe enciclopedia, published in 1997. Some scholars remained unconvinced, one describing the discovery of the Codex as "rather like finding a picture of St. Paul's vision of Christ on the road to Damascus, drawn by St. Luke and signed by St. Peter." 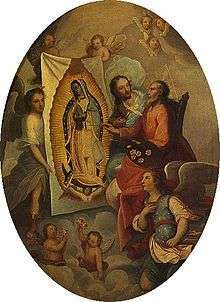 In the earliest account of the apparition, the Nican Mopohua, the Virgin Mary tells Juan Bernardino, the uncle of Juan Diego, that the image left on the tilma is to be known by the name "the Perfect Virgin, Holy Mary of Guadalupe." Scholars do not agree as to how the name "Guadalupe" was ascribed to the image. Some believe that the Spanish transcribed or transliterated a Nahuatl name, as the site had long been an important sacred spot. 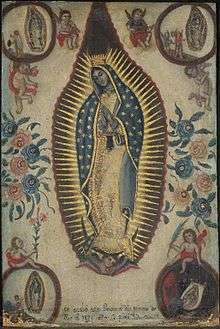 Others hold that the Spanish name Guadalupe is the original name, and refers to the Spanish Our Lady of Guadalupe, Extremadura, whose cult had been important in Spain in the 16th century and had been brought to the New World with the Spanish conquest. The first theory to promote a Nahuatl origin was that of Luis Becerra Tanco. In his 1675 work Felicidad de Mexico, Becerra Tanco claimed that Juan Bernardino and Juan Diego would not have been able to understand the name Guadalupe because the "d" and "g" sounds do not exist in Nahuatl. He proposed two Nahuatl alternative names that sound similar to "Guadalupe", Tecuatlanopeuh [tekʷat͡ɬaˈnopeʍ], which he translates as "she whose origins were in the rocky summit", and Tecuantlaxopeuh [tekʷant͡ɬaˈʃopeʍ], "she who banishes those who devoured us." Ondina and Justo Gonzalez suggest that the name is a Spanish version of the Nahuatl term, Coātlaxopeuh [koaːt͡ɬaˈʃopeʍ], which they interpret as meaning “the one who crushes the serpent,” and that it may be referring to the feathered serpent Quetzalcoatl. In addition, Mary was portrayed in European art as crushing the serpent of the Garden of Eden. According to another theory the juxtaposition of Guadalupe and a snake may indicate a nexus with the Aztec goddess of love and fertility, Tonantzin (in Nahuatl "Our Revered Mother"), who also went under the name of Coatlícue ("The Serpent Skirt"). This appears to be borne out by the fact that this goddess had had a temple dedicated to her on the very Tepeyac Hill where Juan Diego had his vision, temple which had recently been destroyed at the behest of the new Catholic authorities. In the 16th century the Franciscans were suspicious that the cult of Guadalupe showed, or was susceptible to, elements of syncretism, i.e. the importation of an object of reverence in one belief system into another (see above). Juan Diego and Juan Bernardino would have been familiar with the Spanish language "g" and "d" sounds since their baptismal names contain those sounds. There is no documentation of any other name for the Virgin during the almost 144 years between the apparition being recorded in 1531 and Becerra Tanco's proposed theory in 1675. Documents written by contemporary Spaniards and Franciscan friars argue that for the name to be changed to a native name, such as Tepeaca or Tepeaquilla, would not make sense if a Nahuatl name were already in use, and suggest the Spanish Guadalupe was the original. The image features a full-length representation of a mestiza girl or young woman with high cheek-bones, delicate features, and straight, unbraided black hair simply parted in the middle framing her face. The subject matter is in a standing posture showing in contemplative prayer with hands joined and little finger separated and head slightly inclined; she gazes with heavy-lidded eyes at a spot below and to her right, and to left in viewpoint of the observer. She is dressed from neck to feet in a pink robe and blue-green cerulean mantle, one side folded within the arms, emblazoned with eight-point stars with two black tassels tied at high waist, wearing a neck brooch featuring a colonial styled cross. The robe is spangled with a small gold quatrefoil motif ornamented with vines and flowers, its sleeves reaching to her wrists where the cuffs of a white undergarment appear. The subject stands on a crescent moon, allegedly color silver in the past and now have turned dark. A feathered cherubic angel with outstretched arms carries the robe on her exposed feet which is uncolored. A sunburst of straight and wavy gold rays interchange behind while projecting behind the Virgin are enclosed within a mandorla. Beyond the mandorla to right and left is an unpainted expanse, white in colour with a faint blue tinge. The present image shows the 1791 nitric acid spill on the top right side, unaffecting the subject matter's aureola. The portrait was executed on a fabric support of natural material constituted by two pieces (originally three) joined together. The join is clearly visible as a seam passing from top to bottom, with the Virgin's face and hands and the head of the angel on the left piece. It passes through the left wrist of the Virgin. The fabric is mounted on a large metal sheet to which it has been glued for some time. The image, currently set in a massive frame protected behind bullet-proof glass, hangs inclined at a slight angle on the wall of the basilica behind the altar. At this point, there is a wide gap between the wall and the sanctuary facilitating closer viewing from moving walkways set on the floor beneath the main level of the basilica, carrying people a short distance in either direction. Viewed from the main body of the basilica, the image is located above and to the right of the altar and is retracted at night into a small vault (accessible by steps) set into the wall. An intricate metal crown designed by the painter Salomé Pina according to plans devised by Rómulo Escudero and Pérez Gallardo, and executed by the Parisian goldsmith, Edgar Morgan, is fixed above the image by a rod, and a massive Mexican flag is draped around and below the frame. The nature of the fabric is discussed below. Its measurements were taken by José Ignacio Bartolache on December 29, 1786 in the presence of Joseph Bernardo de Nava, a public notary: height 170 cm (67 in), width 105 cm (41 in). The original height (before it was first shielded behind glass in the late 18th century, at which time the unpainted portion beyond the Virgin's head must have been cut down) was 229 cm (90 in). The original tilma of Saint Juan Diego, which hangs above the high altar of the Guadalupe Basilica. The suspended crown atop the image dates back to its Canonical Coronation on October 12, 1895. The image is protected by bulletproof glass and low-oxygen atmosphere. Neither the fabric ("the support") nor the image (together, "the tilma") has been analyzed using the full range of resources now available to museum conservationists. Four technical studies have been conducted so far. Of these, the findings of at least three have been published. Each study required the permission of the custodians of the tilma in the Basilica. However, Callahan's study was taken at the initiative of a third party: the custodians did not know in advance what his research would reveal. MC – in 1756 a prominent artist, Miguel Cabrera, published a report entitled Maravilla Americana, containing the results of the ocular and manual inspections by him and six other painters in 1751 and 1752. G – José Antonio Flores Gómez, an art restorer, discussed in a 2002 interview with the Mexican journal Proceso, certain technical issues relative to the tilma. He had worked on it in 1947 and 1973. PC – in 1979 Philip Callahan, (biophysicist, USDA entomologist, NASA consultant) specializing in infrared imaging, was allowed direct access to visually inspect, and photograph, the image. He took numerous infrared photographs of the front of the tilma. Taking notes that were later published, his assistant noted that the original art work was neither cracked nor flaked, while later additions (gold leaf, silver plating the moon) showed serious signs of wear, if not complete deterioration. Callahan could not explain the excellent state of preservation of the un-retouched areas of the image on the tilma, particularly the upper two-thirds of the image. His findings, with photographs, were published in 1981. R – In 2002 Proceso published an interview with José Sol Rosales, formerly director of the Center for the Conservation and Listing of Heritage Artifacts (Patrimonio Artístico Mueble) of the National Institute of Fine Arts (INBA) in México City. The article included extracts from a report which Rosales had written in 1982 of his findings from his inspection of the tilma that year using raking and UV light. It was done at low magnification with a stereo microscope of the type used for surgery. Canvas Support: The material of the support is soft to the touch (almost silken: MC; something like cotton: G) but to the eye it suggested a coarse weave of palm threads called "pita" or the rough fiber called "cotense" (MC), or a hemp and linen mixture (R). It was traditionally held to be made from ixtle, an agave fiber. Ground, or primer: R asserted (MC and PC contra) by ocular examination that the tilma was primed, though with primer "applied irregularly." R does not clarify whether his observed "irregular" application entails that majorly the entire tilma was primed, or just certain areas – such as those areas of the tilma extrinsic to the image – where PC agrees had later additions. MC, alternatively, observed that the image had soaked through to the reverse of the tilma. Detail of the face. Note the discoloration on the top part of the head, where a crown is claimed to have been present at some point, now obscured by an enlarged frame for unknown reasons. Under-drawing: PC asserted there was no under-drawing. Brush-work: R suggested (PC contra) there was some visible brushwork on the original image, but in a minute area of the image ("her eyes, including the irises, have outlines, apparently applied by a brush"). Condition of the surface layer: PC reports that the un-retouched portions of the image, particularly the blue mantle and the face, are in a very good state of preservation, with no flaking or peeling. The three most recent inspections (G, PC and R) agree (i) that additions have been made to the image (gold leaf added to the sun's rays-which has flaked off; silver paint or other material to depict the moon - which has discolored; and the re-construction or addition of the angel supporting the Marian image), and (ii) that portions of the original image have been abraded and re-touched in places. Some flaking is visible, though only in retouched areas (mostly along the line of the vertical seam, or at passages considered to be later additions). Varnish: The tilma has never been varnished. Binding Medium: R provisionally identified the pigments and binding medium (distemper) as consistent with 16th-century methods of painting sargas (MC, PC contra for different reasons), but the color values and luminosity are in good condition. The technique of painting on fabric with water-soluble pigments (with or without primer or ground) is well-attested. The binding medium is generally animal glue or gum arabic (see: Distemper). Such an artifact is variously discussed in the literature as a tüchlein or sarga. Tüchlein paintings are very fragile, and are not well preserved, so the tilma's color values and state of preservation are very good. 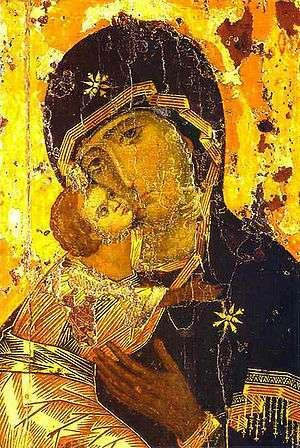 The iconography of the Virgin is fully Catholic: Miguel Sanchez, the author of the 1648 tract Imagen de la Virgen María, described her as the Woman of the Apocalypse from the New Testament's Revelation 12:1, "clothed with the sun, and the moon under her feet, and upon her head a crown of twelve stars.” She is described as a representation of the Immaculate Conception. Virgil Elizondo says the image also had layers of meaning for the indigenous people of Mexico who associated her image with their polytheistic deities, which further contributed to her popularity. Her blue-green mantle was the color reserved for the divine couple Ometecuhtli and Omecihuatl; her belt is interpreted as a sign of pregnancy; and a cross-shaped image, symbolizing the cosmos and called nahui-ollin, is inscribed beneath the image's sash. She was called "mother of maguey," the source of the sacred beverage pulque. Pulque was also known as "the milk of the Virgin." The rays of light surrounding her are seen to also represent maguey spines. 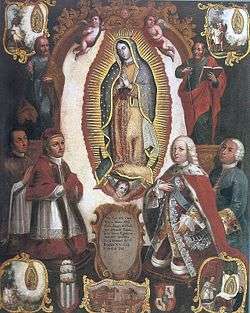 Allegory of the papal declaration in 1754 by pope Benedict XIV of Our Lady of Guadalupe patronage over the New Spain in the presence of the viceroyal authorities. Anonymous (Mexican) author, 18th century. "...this New World has been won and conquered by the hand of the Virgin Mary ... [who had] prepared, disposed, and contrived her exquisite likeness in this her Mexican land, which was conquered for such a glorious purpose, won that there should appear so Mexican an image." Throughout the Mexican national history of the 19th and 20th centuries, the Guadalupan name and image have been unifying national symbols; the first President of Mexico (1824–29) changed his name from José Miguel Ramón Adaucto Fernández y Félix to Guadalupe Victoria in honor of the Virgin of Guadalupe. 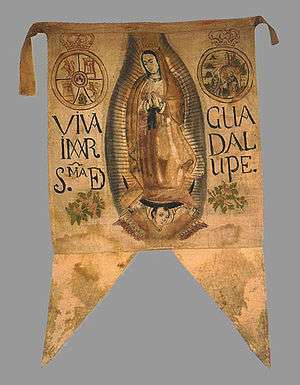 Father Miguel Hidalgo, in the Mexican War of Independence (1810), and Emiliano Zapata, in the Mexican Revolution (1910), led their respective armed forces with Guadalupan flags emblazoned with an image of Our Lady of Guadalupe. In 1999, the Church officially proclaimed her the Patroness of the Americas, the Empress of Latin America, and the Protectress of Unborn Children. The revolutionary banner carried by Miguel Hidalgo and his insurgent army during the Mexican War of Independence. New Spain puts less faith in its own efforts than in the power of God and the intercession of its Blessed Mother, who appeared within the precincts of Tepeyac as the miraculous image of Guadalupe that had come to comfort us, defend us, visibly be our protection. Simón Bolívar noticed the Guadalupan theme in these uprisings, and shortly before Morelos's execution in 1815 wrote: "the leaders of the independence struggle have put fanaticism to use by proclaiming the famous Virgin of Guadalupe as the queen of the patriots, praying to her in times of hardship and displaying her on their flags ... the veneration for this image in Mexico far exceeds the greatest reverence that the shrewdest prophet might inspire." In 1912, Emiliano Zapata's peasant army rose out of the south against the government of Francisco Madero. Though Zapata's rebel forces were primarily interested in land reform – "tierra y libertad" ('land and liberty') was the slogan of the uprising – when his peasant troops penetrated Mexico City they carried Guadalupan banners. More recently, the contemporary Zapatista National Liberation Army (EZLN) named their "mobile city" in honor of the Virgin: it is called Guadalupe Tepeyac. EZLN spokesperson Subcomandante Marcos wrote a humorous letter in 1995 describing the EZLN bickering over what to do with a Guadalupe statue they had received as a gift. The Aztecs ... had an elaborate, coherent symbolic system for making sense of their lives. When this was destroyed by the Spaniards, something new was needed to fill the void and make sense of New Spain ... the image of Guadalupe served that purpose. Hernán Cortés, the Conquistador who overthrew the Aztec empire in 1521, was a native of Extremadura, home to Our Lady of Guadalupe. By the 16th century the Extremadura Guadalupe, a statue of the Virgin said to be carved by Saint Luke the Evangelist, was already a national icon. It was found at the beginning of the 14th century when the Virgin appeared to a humble shepherd and ordered him to dig at the site of the apparition. The recovered Virgin then miraculously helped to expel the Moors from Spain, and her small shrine evolved into the great Guadalupe monastery. According to the traditional account, the name of Guadalupe was chosen by the Virgin herself when she appeared on the hill outside Mexico City in 1531, ten years after the Conquest. Guadalupe continues to be a mixture of the cultures which blended to form Mexico, both racially and religiously, "the first mestiza", or "the first Mexican". "bringing together people of distinct cultural heritages, while at the same time affirming their distinctness." As Jacques Lafaye wrote in Quetzalcoatl and Guadalupe, "as the Christians built their first churches with the rubble and the columns of the ancient pagan temples, so they often borrowed pagan customs for their own cult purposes." The author Judy King asserts that Guadalupe is a "common denominator" uniting Mexicans. Writing that Mexico is composed of a vast patchwork of differences – linguistic, ethnic, and class-based – King says "The Virgin of Guadalupe is the rubber band that binds this disparate nation into a whole." The Mexican novelist Carlos Fuentes once said that "you cannot truly be considered a Mexican unless you believe in the Virgin of Guadalupe." Nobel Literature laureate Octavio Paz wrote in 1974 that "the Mexican people, after more than two centuries of experiments, have faith only in the Virgin of Guadalupe and the National Lottery". 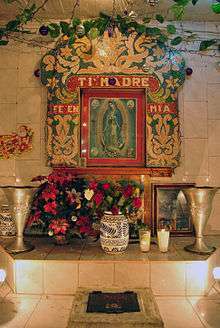 Our Lady of Guadalupe, Juan Diego, and the tilma have been investigated through film several times in recent history. One of the most notable and thorough filmic investigations was done by director Tim Watkins in the 2013 film The Blood & The Rose. Documentarians have been portraying the message of Our Lady of Guadalupe since the 1990s in an attempt to bring the message of the apparition to the North American audience. Pope Benedict XIV, in the Papal bull Non Est Equidem of 25 May 1754, declared Our Lady of Guadalupe patron of what was then called New Spain, corresponding to Spanish Central and Northern America, and approved liturgical texts for the Holy Mass and the Breviary in her honor. Pope Leo XIII granted new texts in 1891 and on 8 February 1887 authorized Canonical Coronation of the image, which occurred on 12 October 1895. Pope Pius X proclaimed her patron of Latin America in 1910. Pope Pius XI declared Our Lady of Guadalupe "Heavenly Patroness of the Philippines" on 16 July 1935 and the relative Apostolic Letter was signed by Vatican Secretary of State, Cardinal Eugenio Pacelli (later Pope Pius XII). This was revised on 12 September 1942, when Pope Pius XII, by the Apostolic Letter Impositi Nobis constituted and declared the Blessed Virgin Mary under the title Immaculate Conception as "Principal and Universal Patroness of the Philippine Islands", with Saint Pudentiana and Saint Rose of Lima constituted and declared to be the secondary patronesses. Pope Pius XII accorded her the title "Queen of Mexico and Empress of the Americas" in 1945, and "Patroness of the Americas" in 1946. Pope John XXIII invoked her as "Mother of the Americas" in 1961, referring to her as Mother and Teacher of the Faith of All American populations. Pope Paul VI gave the image a Golden Rose on 20 March 1966. Pope John Paul II visited her shrine on 26 January 1979, and again when he beatified Juan Diego there on 6 May 1990. In 1992, he dedicated to Our Lady of Guadalupe a chapel within Saint Peter's Basilica in the Vatican. At the request of the Special Assembly for the Americas of the Synod of Bishops, he reiterared her title as patroness of the Americas on 22 January 1999 and granted the rank of solemnity in that particular region. The same Pontiff included in the General Roman Calendar, as optional memorials, the liturgical celebrations for the Feast of Our Lady of Guadalupe (December 12). Pope Francis granted the image a second Golden Rose via Cardinal Ouellet for presentation at the shrine on 18 November 2013. The same Pontiff granted a new gold-plated silver crown with an accompanying prayer to the image during his Apostolic Visit to the Minor Basilica of Guadalupe on 13 February 2016. The crown piece contained a Latin inscription "Mater Mea, Spes Mea. " (My Mother and my Hope). Altar in a market of Mexico City. Roman Catholic sources claim many miraculous and supernatural properties for the image such as that the tilma has maintained its structural integrity over nearly 500 years against soot, candle wax, incense, constant manual veneration by devotees and the historical fact that the image was displayed without any protective glass for the first 115 years; while replicas normally last only about 15 years before suffering degradation; that it repaired itself with no external help after a 1791 nitric acid that spilled on the top right of the image causing considerable damage but left the aureola of the Virgin intact. Furthermore, on 14 November 1921 a bomb hidden within a basket of flowers brought by anti-Catholic secularist damaged the altar, but left the tilma unharmed. A brass standing Crucifix, bent in the explosion, is now preserved at the shrine museum and is believed to be miraculous among devotees. 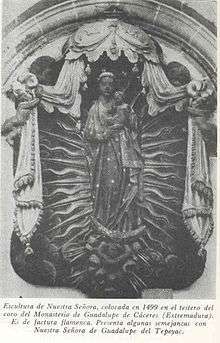 In 1929 and 1951 photographers claimed to have found a figure reflected in the Virgin's eyes; upon inspection they said that the reflection was tripled in what is called the Purkinje effect, commonly found in human eyes. An ophthalmologist, Dr. Jose Aste Tonsmann, later enlarged an image of the Virgin's eyes by 2500x and claimed to have found not only the aforementioned single figure, but images of all the witnesses present when the tilma was first revealed before Zumárraga in 1531, plus a small family group of mother, father, and a group of children, in the center of the Virgin's eyes, fourteen people in all. 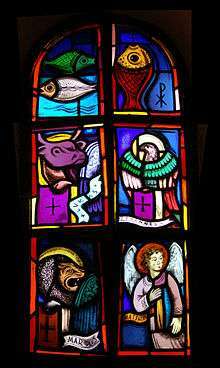 Numerous Catholic websites repeat an unsourced claim that in 1936 biochemist Richard Kuhn analyzed a sample of the fabric and announced that the pigments used were from no known source, whether animal, mineral or vegetable. Dr. Philip Serna Callahan, who photographed the icon under infrared light, declared from his photographs that portions of the face, hands, robe, and mantle had been painted in one step, with no sketches or corrections and no visible brush strokes. The shrine of the Virgin of Guadalupe is the most visited Catholic pilgrimage destination in the world. Over the Friday and Saturday of December 11 to 12, 2009, a record number of 6.1 million pilgrims visited the Basilica of Guadalupe in Mexico City to commemorate the anniversary of the apparition. The Virgin of Guadalupe is considered the Patroness of Mexico and the Continental Americas; she is also venerated by Native Americans, on the account of the devotion calling for the conversion of the Americas. 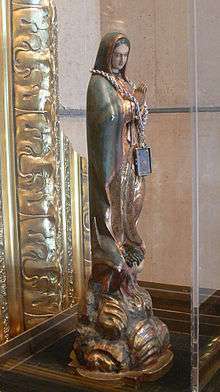 Replicas of the tilma can be found in thousands of churches throughout the world, and numerous parishes bear her name. Due to a claim that her black girdle indicates pregnancy on the image, the Blessed Virgin Mary, under this title is popularly invoked as Patroness of the Unborn and a common image for the Pro-Life movement. The Cathedral of Our Lady of Guadalupe in Zamora, Michoacán, Mexico. The Shrine of Our Lady of Guadalupe, in La Crosse, Wisconsin, United States of America. The Cathedral of Our Lady of Guadelupe, see of the Roman Catholic Diocese of Basse-Terre, on the Lesser Antillian island and French overseas department Guadeloupe, which also bears her name. The Cathedral of Our Lady of Guadalupe (Ponce Cathedral) in Ponce, Puerto Rico, United States, Antilles. Diocesan Shrine of Our Lady of Guadalupe, Pagsanjan, Laguna, Philippines. National Shrine of Our Lady of Guadalupe, Makati City, Philippines. Church of Our Lady of Guadalupe, Puchong. Kuala Lumpur, Malaysia. ↑ Sousa, Lisa; Stafford Poole; James Lockhart (trans. and trans.) (1998). The Story of Guadalupe: Luis Laso de la Vega's Huei tlamahuiçoltica of 1649. UCLA Latin American studies, vol. 84; Nahuatl studies series, no. 5. Stanford & Los Angeles, California: Stanford University Press, UCLA Latin American Center Publications. ISBN 0-8047-3482-8. OCLC 39455844. p.65. ↑ This apparition is somewhat elided in the Nican Mopohua but is implicit in three brief passages (Sousa et al., pp. 75, 77, 83). 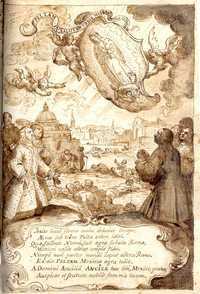 It is fully described in the Imagen de la Virgen María of Miguel Sánchez published in 1648. ↑ English translation of the Nican Mopohua, a 17th-century account written in the native Nahuatl language. ↑ The date does not appear in the Nican Mopohua, but in Sanchez's Imagen. ↑ The procession and miracle are not part of the Nican Mopohua proper, but introduce the Nican Mopectana which immediately follows the Nican Mopohua in the Huei tlamahuiçoltica. ↑ D. A. Brading, Mexican Phoenix: Our Lady of Guadalupe, (Cambridge University Press, 2001,) pp. 1–2. ↑ Códice 1548 o "Escalada"
1 2 Peralta, Alberto (2003). "El Códice 1548: Crítica a una supuesta fuente Guadalupana del Siglo XVI". Artículos (in Spanish). Proyecto Guadalupe. Retrieved December 1, 2006. , Poole, Stafford (July 2005). "History vs. Juan Diego". The Americas. 62: 1–16. doi:10.1353/tam.2005.0133. , Poole, Stafford (2006). The Guadalupan Controversies in Mexico. Stanford, California: Stanford University Press. ISBN 978-0-8047-5252-7. OCLC 64427328. 1 2 D. Brading (2001), Mexican Phoenix: Our Lady of Guadalupe: Image and Tradition Across Five Centuries, Cambridge University Press, pp. 117-118, cf. p. 359. 1 2 León-Portilla, Miguel; Antonio Valeriano (2000). Tonantzin Guadalupe : pensamiento náhuatl y mensaje cristiano en el "Nicān mopōhua" (in Spanish). Mexico: Colegio Nacional: Fondo de Cultura Económico. ISBN 968-16-6209-1. 1 2 Burrus S. J., Ernest J. (1981). "The Oldest Copy of the Nican Mopohua". Cara Studies in Popular Devotion. Washington D.C.: Center for Applied Research in the Apostolate (Georgetown University). II, Guadalupan Studies (4). OCLC 9593292. 1 2 O'Gorman, Edmundo (1991). Destierro de sombras : luz en el origen de la imagen y culto de Nuestra Señora de Guadalupe del Tepeyac (in Spanish). Mexico: Universidad Nacional Autónoma de México. ISBN 968-837-870-4. ↑ Robert Ricard, The Spiritual Conquest of Mexico. Translated by Lesley Byrd Simpson. Berkeley: University of California Press 1966, p. 188. ↑ Ricard, Spiritual Conquest, p. 189. ↑ J. Nickell, "Image of Guadalupe: myth - perception". Skeptical Inquirer 21:1 (January/ February 1997), p.9. ↑ Jody Brant Smith, The image of Guadalupe, Mercer University Press, 1994, p. 73. ↑ Ricard, Spiritual Conquest, p. 190. ↑ Bernardino de Sahagún, Florentine Codex: Introduction and Indices, Arthur J.O. Anderson and Charles Dibble, translators. Salt Lake City: University of Utah Press, 1982, p. 90. ↑ L. Burkhart (2001). 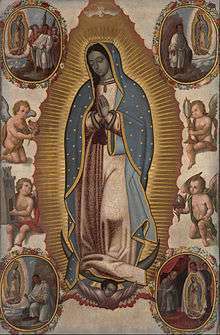 Before Guadalupe: the Virgin Mary in early colonial Nahuatl literature. Austin: University of Texas Press. ↑ Sousa, Lisa; Stafford Poole; James Lockhart (trans. and trans.) (1998). The Story of Guadalupe: Luis Laso de la Vega's Huei tlamahuiçoltica of 1649. UCLA Latin American studies, vol. 84; Nahuatl studies series, no. 5. Stanford & Los Angeles, California: Stanford University Press, UCLA Latin American Center Publications. ISBN 0-8047-3482-8. OCLC 39455844. pp. 42–47. ↑ The Story of Guadalupe: Luis Laso de la Vega's Huei tlamahuiçoltica of 1649. UCLA Latin American studies, vol. 84; Nahuatl studies series, no. 5. Stanford University Press, UCLA Latin American Center Publications; pp. 42-47. ↑ Story of the manuscript, as told by Thomas Lannon, assistant curator of the New York Public Library. A digital scan of the manuscript is available here. ↑ Treviño, Eduardo Chávez ; translated from Spanish by Carmen; Montaño, Veronica (2006). Our Lady of Guadalupe and Saint Juan Diego : the historical evidence. Lanham, Md. : Rowman & Littlefield Publishers. p. 121 of 212. ISBN 0742551059. 1 2 "Virgen de Guadalupe". Mariologia.org. Archived from the original on April 26, 2012. Retrieved August 13, 2012. ↑ Callahan, Philip Serna, The Tilma under infra-red radiation, CARA Studies on Popular Devotion, vol. II: Guadalupanan Studies No.3, p. 16. ↑ See Enciclopedia Guadalupana, p.267 (vol.2). ↑ See Enciclopedia Guadalupana, p.536f. (vol.3). The December 2001 issue (special edition) of Guia México Desconocido (p. 86) dedicated to the Virgen de Guadalupe has a fact box on p. 21 which gives slightly different dimensions: height 178 by 103 cm wide (70 by 41 in). ↑ See Fernández de Echeverría y Veytia (1718-1780), Baluartes de México, (publ. posthumously, 1820), p.32. ↑ Vera, Rodrigo: "Un restaurador de la guadalupana expone detalles técnicos que desmitifican a la imagen", Revista Proceso N° 1343, July 27, 2002, pp. 17–18, cf. ↑ Doherty, T., & Woollett, A. T. (2009). Looking at paintings: a guide to technical terms. Getty Publications. ↑ McMenamin, M. (2006). "Our Lady of Guadalupe and Eucharistic Adoration". Numismatics International Bulletin. 41 (5): 91–97. 1 2 Taylor, William B. (1979). "Drinking, Homicide, and Rebellion in Colonial Mexican Villages". Stanford: Stanford University Press. ↑ Del Maguey, Single Village Mezcal. "What if Pulque?". Retrieved September 11, 2009. ↑ Bushnell, John (1958). "La Virgen de Guadalupe as Surrogate Mother in San Juan Aztingo". American Anthropologist. 60 (2): 261. doi:10.1525/aa.1958.60.2.02a00050. 1 2 3 Krauze, Enrique. Mexico, Biography of Power. A History of Modern Mexico 1810–1996. HarperCollins: New York, 1997. 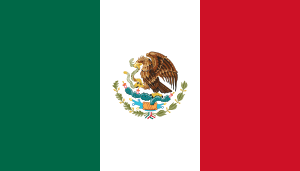 ↑ Documentary footage of Zapata and Pancho Villa's armies entering Mexico City can be seen at YouTube.com, Zapata's men can be seen carrying the flag of the Guadalupana about 38 seconds in. ↑ Subcomandante Marcos, Flag.blackened.net, "Zapatistas Guadalupanos and the Virgin of Guadalupe" March 24, 1995 , accessed December 11, 2006. ↑ Elizondo, Virgil. AmericanCatholic.org, "Our Lady of Guadalupe. A Guide for the New Millennium" St. Anthony Messenger Magazine Online. December 1999. , accessed December 3, 2006. ↑ Lopez, Lydia. "'Undocumented Virgin.' Guadalupe Narrative Crosses Borders for New Understanding." Episcopal News Service. December 10, 2004. ↑ O'Connor, Mary. "The Virgin of Guadalupe and the Economics of Symbolic Behavior." The Journal for the Scientific Study of Religion. Vol. 28, Issue 2. pp. 105-119. 1989. ↑ Acta Apostolicae Sedis 28 (1936), pp.63f. - 16 Iulii (July) 1935. Pius XI. Beatissima Virgo Maria Sub Titulo de Guadalupa Insularum Philippinarum Coelestis Patrona Declaratur. ↑ http://lifestyle.inquirer.net, "Our Lady of Guadalupe is secondary patroness of the Philippines"
↑ Acta Apostolicae Sedis 34 (1942), pp.336f. 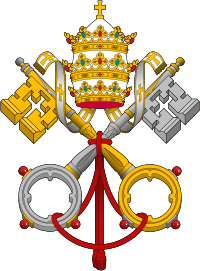 ↑ See the speeches delivered by Pope Paul VI on each occasion. ↑ Catholic News Agency report dated November 22, 2013 , accessed 256 March 2015. ↑ D.A. Brading, Mexican Phoenix. Our Lady of Guadalupe: Image and Tradition Across Five Centuries, Cambridge University Press: Cambridge, (2001), p.314; Stafford Poole, The Guadalupan Controversies in Mexico, Stanford, California: Stanford University Press (2006), p. 110. 1 2 "Science Sees What Mary Saw From Juan Diego's Tilma", catholiceducation.org Archived June 20, 2010, at the Wayback Machine. ↑ Sennott, Br. Thomas Mary. MotherOfAllPeoples.com , "The Tilma of Guadalupe: A Scientific Analysis". Wikimedia Commons has media related to Our Lady of Guadalupe (Tepeyac). NEWS.BBC.co.uk, BBC photo essay of December 12 festivities in San Miguel de Allende, Gto.